RenegadeSims provides free custom content for The Sims 2! We offer fixed paysite hair meshes and recolours, and various other custom content. If the SecuROM in EA Games products such as Spore, Mass Effect, The Sims 2, etc. have negatively affected your computer, please read this important information. Two Class Action Lawsuits have been filed against EA Games: one for SecuROM in Spore, the other for Mass Effect - they apply to consumers GLOBALLY. The third is a pre-filing investigation for any EA Games product containing SecuROM - this applies to consumers of the United States. If you have any technical information about DRM software, or can demonstrate issues caused by SecuROM, let these attorneys know. Their contact information, and further clarification regarding these lawsuits, can be found on the front page of ReclaimYourGame.com. Companies like EA Games have NO RIGHT to secretly install invasive DRM software on our computers, so take action and Reclaim Your Game today! Note: Updates are done as often as possible, but I cannot guarantee their frequency! RenegadeSims ModestSea - 4 swimwear/sleepwear outfits, from the WickedNoukFamily March 2010 Beach/Summer Aspiration Reward Set! RenegadeSims Teen SimpleWear - 7 full body female outfits, from the WickedNoukFamily September 2009 Aspiration Reward Set! 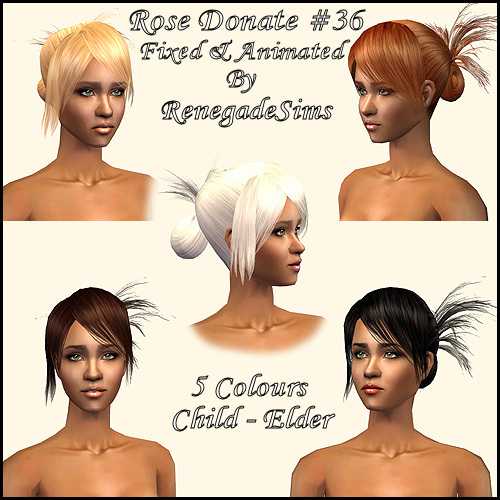 Rose Donation Hair 36 added - 5 binned colours. If you need to contact me, send me a PM at the Wicked Nouk Family forum. At this time, I DO NOT make new hair meshes from scratch, but I put a lot of work into fixing terrible paysite hair meshes. Meshes are INCLUDED in the download, if the download requires a mesh. If you don't know how to put downloads in your game, Click Here. If an expansion pack is required, it will say so on the download. At this time, I do not take requests. My hosting is provided by the Wicked Nouk Family servers.